The Musée du Louvre is the most visited museum in Paris, perhaps in the whole world, and rightly so. I doubt I will ever find enough time to do justice to all it has to offer. But when you are done here, a short walk down to the Musée de l’Orangerie can be a highly rewarding experience. 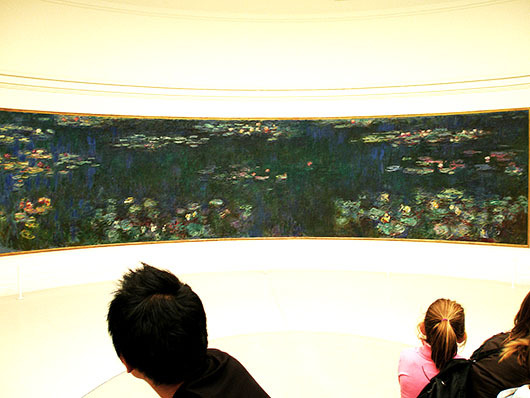 The highlight – a series of the famous ‘Waterlilies’ by Claude Monet. Monet devoted an enormous amount of time in creating his beautiful garden in Giverny, and then an equal amount of time translating them onto canvas. These stunning works are considered unique in landscape art, not just for their shape and size, but also for the absence of horizon lines. And remarkably most of them were painted in the last three decades of his life, when his eyes were clouded with cataracts! Eight enormous canvas panels are housed in two elliptical rooms, specially redesigned to let in natural light, the essence of all impressionist art. The result is a remarkable tableaux of changing colour and mood, with every change in weather, seasons and the hours of the day! The Nymphéa are certainly special. But don’t forget to check out the other Impressionist masterpieces in the underground gallery. A visit to this less visited – at the time at least – museum, was one of my treasured moments in Paris. Wow, I wish I had seen these when I was in Paris, twice!! I love the Impressionist paintings. I’d like to camp out in there for a week, a day visit is never enough. 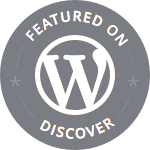 thank you for featuring Monet’s great garden project! Noted down for my next visit to Paris. I love it when you show us little corners forgotten by the beaten track…Thanks! Beautiful narrative that helps us experience it. Thanks. I love Monet’s works. How wonderful to see these panels up close, Madhu. How on earth did he manage to create such wonders whilst suffering from cataracts? Wonderful entry Madhu! This is my favorite museum in Paris!!!!! When I lived in France back in the 1990s I wanted so bad to visit Giverny but never made it. Someday!!!! I can only imagine the beauy of these displays. Thanks for the wonderful photos. I spent 10 months in Paris and this was by far my favourite museum. The paintings are breathtaking and you can spend a long time looking at them. Ebbene sì, hai ragione. Personalmente ho passato intere giornate nel museo del Louvre… ma credo che neppure un mese intero sarebbe sufficiente! Serenità e grazie per queste bellissime foto…. 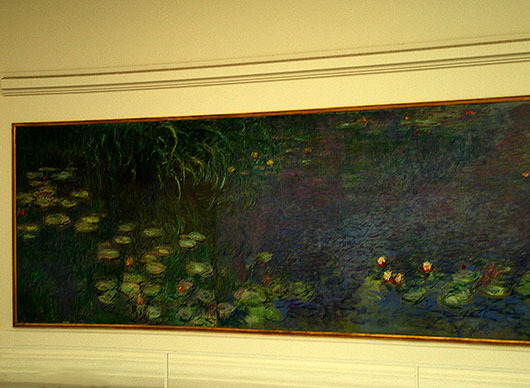 Beautiful shots of the eight panels Monet’s water lilies painting! Thank you, Madhu! Thank you for sharing! I’ve been to Paris twice, went to the Louvre and Giverny, but did not see this museum. Maybe next time if there is a next time. I’m a big fan of Monet. 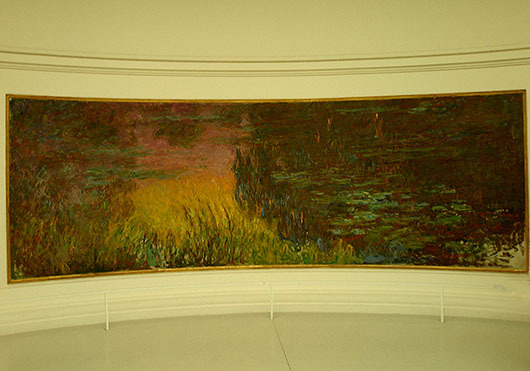 The Musée de l’Orangerie is, indeed, a wonderful art museum – especially if you love Monet as I do. How did you get the photos? When I was there, it was thoroughly discouraged. L’Orangerie is indeed wonderful! Another excellent museum for fans of Monet is the Musée Marmottan, which also has a circular room for displaying their splendid Monet collection. I was lucky enough to go to Monet’s house several years ago and you can see why he was inspired to paint such beautiful works. Thanks for the colorful post. a marvellous post madhu, we visited the orangerie last year and everyone was taking photos …this year we saw giverny! I love Monet’s work. Seeing it in person was a breathtaking experience and made him forever my favourite artist. I would LOVE to see that exhibit…I’m surprised they allowed pics to be taken…the last few big shows I saw had guards with a keen eye on everyone, looking for contraband to be pulled out (cameras)…so glad you were able to get these captures…one really gets a sense of the scale. Awesome! No adjective can describe beauty of these excellent creations. Had a bad timing when we were there…. it was close. GRRRR. With that… Thanks for the share. Awesome! Love the no-horizontal line part. Fascinating!